July 12 was another busy day for weddings. Emily and Don said their vows in the garden behind the Belle Meade Mansion. Emily is my favorite bride this season because she wanted everyone to be comfortable, including the musicians!! Thanks for thinking of us, Emily! We arrived in khaki slacks and white shirts…quite a change from our usual tux and long black. Emily’s attendants were in cheerful, cool looking, yellow, knee length dresses of varying styles. The children nearly stole the show they were so cute. But I’m ahead of myself….we brought the grandmothers and mothers in to “A Dream Is A Wish Your Heart Makes”. Very sweet. Before the attendants arrived a friend of Emily’s, D.W., from college did a fine job of singing “Come What May”. The attendants and children then came in to “Bittersweet Symphony” after which in a nod to traditional classics Emily met her groom at the altar to “Canon in D”. As Don is a UT fan you get three guesses (the first two don’t count) as to what song they recessed to after being pronounced husband and wife….you got it…”Rocky Top”!! Congratulations to Emily and Don and many wishes for a long and happy life together! 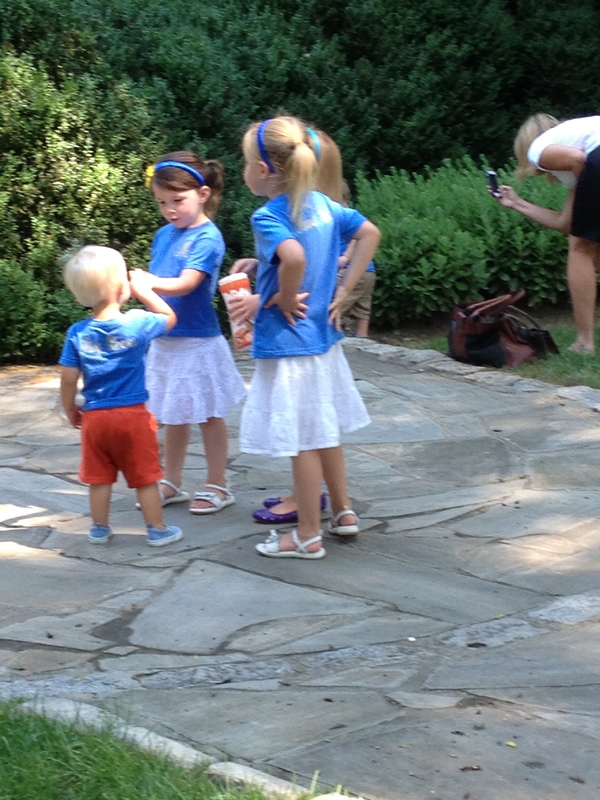 Picture of some of the children in their special “flower girl and ring bearer T-shirts at the rehearsal. When I met with Lisa, the mother of bride, Elizabeth, last summer to begin planning the music the wedding seemed like such a long way off. What seemed like the blink of an eye to me must have seemed like warp speed to Elizabeth. 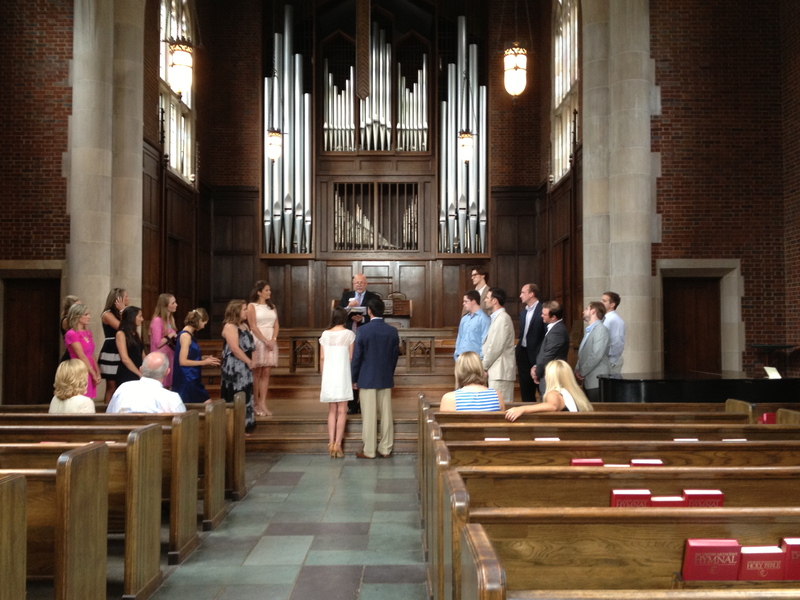 Silver Strings was a quartet for this wedding and what a pleasure to play in the wonderful Benton Chapel on the Vanderbilt Campus. The Catholic service was presided over by Deacon Hans Toecker, a warm and funny character who was such a pleasure to work with. Heather Lannon, the cantor for this service, sang the solos and responses so beautifully. But this is about Elizabeth and Andrew….Elizabeth was absolutely stunning in her gown, my favorite wedding gown of the season, in fact in many years. It was a simple satin gown that draped so beautifully to a short train…or whatever you call the part of the skirt that trails behind. The music was traditional with Elizabeth arriving at the altar to the beautiful “Canon in D”. After the exchange of vows and rings the new Mr. and Mrs. Andrew Glaws then recessed to “La Rejouissance” (The Rejoicing) by Handel. Congratulations to Elizabeth and Andrew and their families! Lauren and Will chose a piano trio because they wanted something close to what The Piano Guys do. Look them up on youtube…they’re fabulous. They do a gorgeous rendition of “A Thousand Years” for which I’ve had quite a few requests. Along with that the trio also played “Home” during the prelude, again similar to the Piano Guys’ rendition. Lauren chose traditional music for the processionals saving “Canon in D” for her entrance. After the first kiss as husband and wife they made their way down the aisle to the strains of the Hornpipe from Handel’s Water Music. Congratulations Lauren and Will! And also to your families! This is a picture taken at the rehearsal.